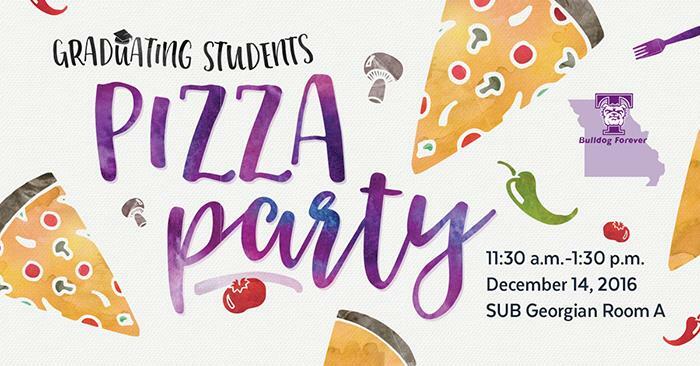 December graduates are invited to attend a free pizza party from 11:30 a.m.-1:30 p.m. on Reading Day, Dec. 14 in the Student Union Building Georgian Room A. Celebrate with fellow graduates and enjoy pizza, provided by the Alumni Association, along with various drinks and desserts. Vegetarian, vegan and gluten-free options are available upon request. In addition, graduates will receive a complimentary alumni t-shirt. Those graduates who cannot attend the event should stop by the Office of Advancement in McClain Hall 205 to pick up their free Truman alumni T-shirt. 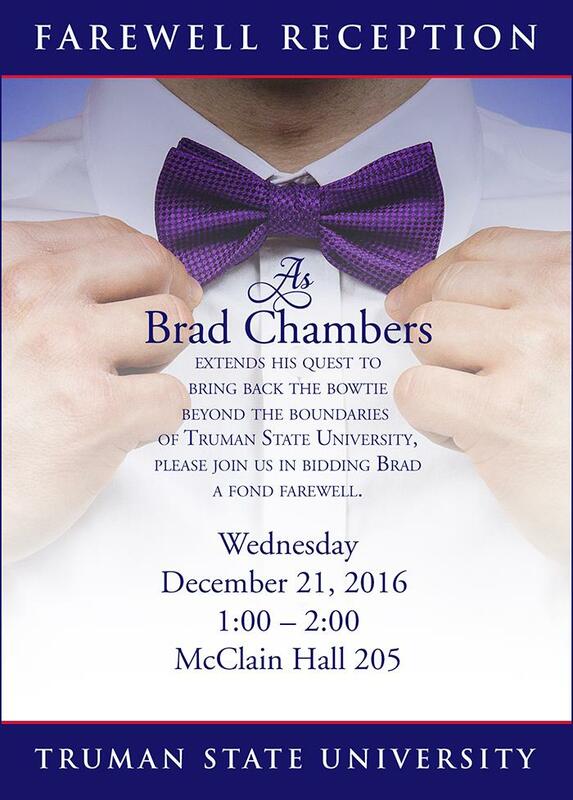 Contact Denise Smith, director of alumni relations, for more information. Students in Greek Life raised $1,630 for men’s cancer research and mental health during the month of November. Greek Life staff headed the event, “Greeks Get Fit for Movember.” It was arranged by working with The Movember Foundation, an organization that strives to educate and raise funds for prostate cancer, testicular cancer, mental health and suicide prevention. The Movember Foundation invests their funds in research and health services that will result in new tests and treatments to better diagnose diseases such as prostate cancer. They hope to use their resources to better understand why some men relapse and others do not. In addition to this research, they develop community-level prevention programs to improve mental health for men and boys to stay healthy. By growing a mustache or pledging to exercise daily throughout November, 32 Greek students participated in the Movember event. Participants were encouraged to use the Student Recreation Center, as prizes were awarded to those who utilized the facilities. Overall, students moved 27.5 miles and walked 785,556 steps. 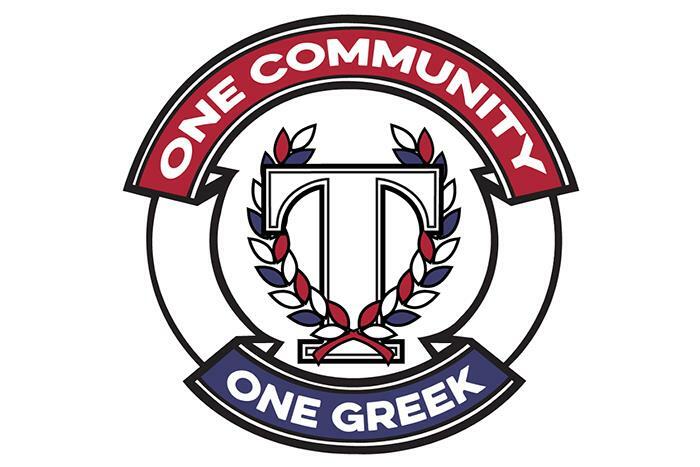 More information about Truman’s Greek community can be found on Facebook, Instagram and Twitter. 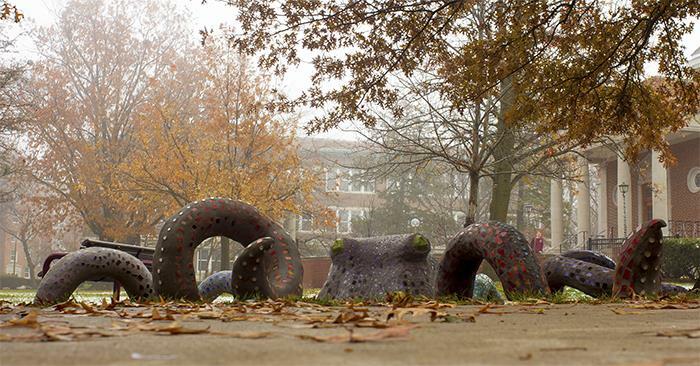 Students in the Introduction to the Visual Arts class constructed the octopus sculpture currently on display on the quad near the library and Kirk Memorial, titled "The Quad Kraken." The course allows non-art majors to explore the arts through different historical periods and themed activities. Danielle Yakle, assistant professor of art, guided the students through the construction process. To create the form of the sculpture, the class welded a steel armature and covered it in concrete using a method that allows the structures to stay hollow. Then the students cut, ground and arranged a glass mosaic on its surface. The head is the largest part of the sculpture, measuring at about 5 feet wide, 6 feet long and 3 and a half feet tall. Each part of the tentacles that touches the ground has a metal bracket through which 12-inch-long stakes are secured. The class chose the form of an octopus in order to construct something fanciful and imaginative that students will pass by every day. They hope to increase each viewer’s attentiveness to campus and inspire positivity. Four students earned $10,000 for Truman thanks to their skills in trading market securities. Bulldog Student Investment Fund students Anthony Hill, Shane Legatzke, Michael Poindexter and Spencer Wilson participated in the thinkorswim Challenge sponsored by TD Ameritrade from Oct. 10 through Nov. 4. Competing as BSIF Elite, the team started with $500,000 in virtual money to invest in real time using TD Ameritrade’s thinkorswim platform. Prizes were awarded to the top three teams with the highest overall percentage gain in their portfolios at the close of the competition and to their respective schools. There were also prizes awarded to teams whose portfolios had the highest percentage gains in aggregate value at the end of each trading week. BSIF Elite ended up with a 90 percent gain and a portfolio value of $950,568, which was good enough to earn third place in a field that featured 726 teams from 233 schools. The team won $10,000 for Truman, and each team member won $1,000 for placing third overall and $500 for winning week four of the competition. The thinkorswim Challenge is offered every year through TD Ameritrade U, an educational program for professors and college-run organizations that provides free access to virtual trading through its thinkorswim trading platform. The goal of the program is to help students prepare for the real world of personal finance by giving them the ability to put classroom theory into real-life investing strategies. The $10,000 has been invested with the Truman State University Foundation in funds that support BSIF. Kirksville came in at No. 26 on the list of the “50 Friendliest College Towns in America 2016” compiled by Great College Deals. Editors of the online resource guide reviewed locations across the country to determine which are the friendliest. They gave consideration to towns with activities offered year round. Cities also needed to be relatively easy to navigate and offer a variety of transportation solutions as well as communities that were culturally diverse or embraced diversity. A sense of community pride, displayed by parades, celebrations and historical acknowledgements, also was a factor. 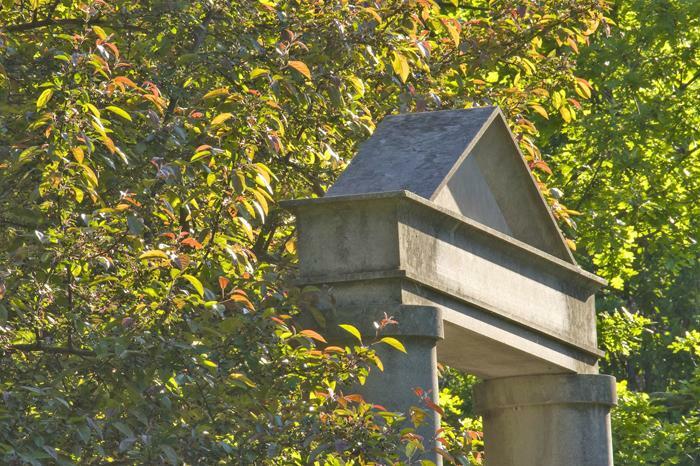 The entry for Kirksville noted its small-town feel and that as the home of Truman and A.T. Still University it was rich in local culture and history. Credit was given for annual events that offer the opportunity to develop traditions for family and friends, including the Scottish Highland Games and a half marathon, among others. 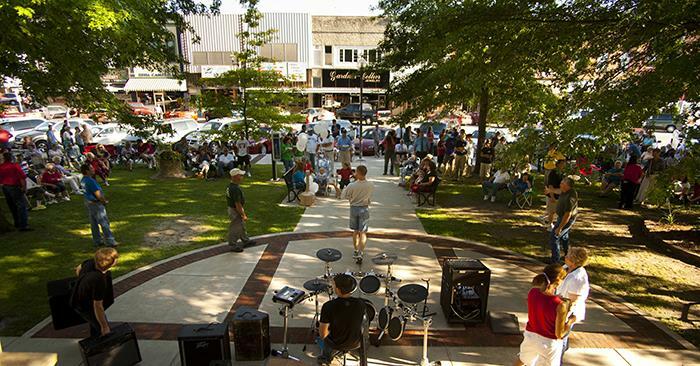 The free Friday Summer on the Square concert series also was recognized for building a sense of community and providing entertainment. 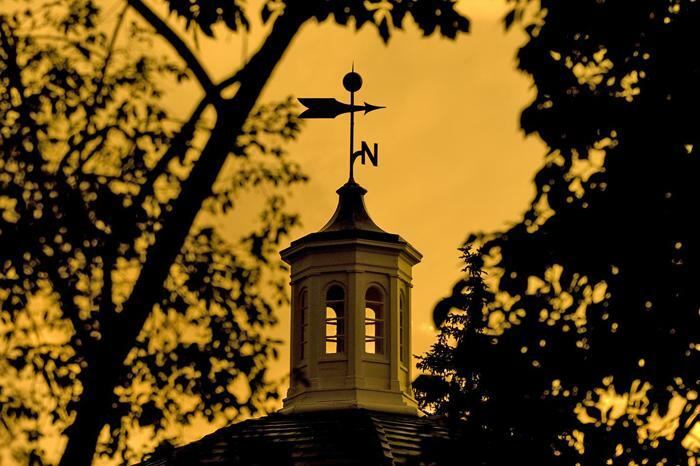 To see the complete list, visit greatcollegedeals.net/friendliest-college-towns-america. Brandon Sorbom, a physicist from the Massachusetts Institute of Technology, will give the commencement address during graduation ceremonies Dec. 17. Sorbom is a sixth-year Ph.D. candidate at MIT and the lead author of the ARC Reactor design study, a student-led conceptual design for a small, modular fusion pilot plant. Along with other students, researchers and engineers at MIT’s Plasma Science and Fusion Center, he is working on applying new superconducting magnet technology to accelerate the development of fusion energy as a usable power source in the future. A native of Southern California, Sorbom received bachelor’s degrees in electrical engineering and engineering physics from Loyola Marymount University in 2010. 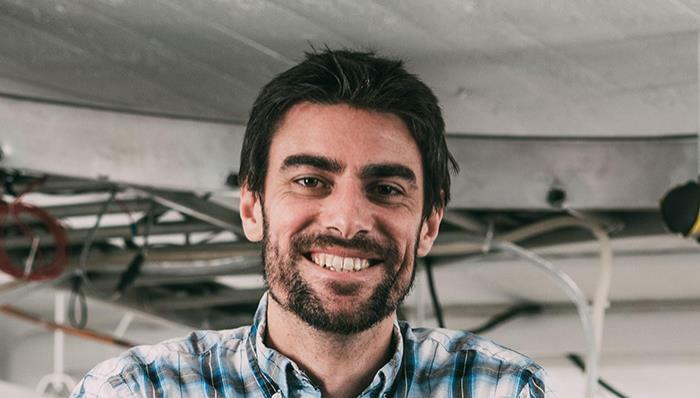 At LMU, he performed undergraduate research in astrophysics and electrostatic confinement fusion, and he built a small fusion device called a Farnsworth Fusor. As part of his thesis work, Sorbom repaired and refurbished an old linear particle accelerator in the basement of his lab building. He is currently using the accelerator to study the response of superconductors in a simulated fusion reactor operating environment. He hopes that his research will help enable a faster path to realizing fusion as a source of clean energy for the world. Sorbom was originally invited to speak at the May graduation ceremony, but the event was cut short due to rain. Graduation ceremonies will take place at 11 a.m. Dec. 17 in Pershing Arena. Following commencement, there will be a reception in the Student Union Building HUB. Graduates, along with their friends and families, are encouraged to share their experiences on social media with #TrumanGraduation, #TrumanCommencement and #BulldogForever. The ceremonies will be livestreamed at livestream.com/TMN, and the campus community can also watch on channel 36. More information about graduation can be found at truman.edu/registrar/commencement/december-2016-commencement-ceremony. 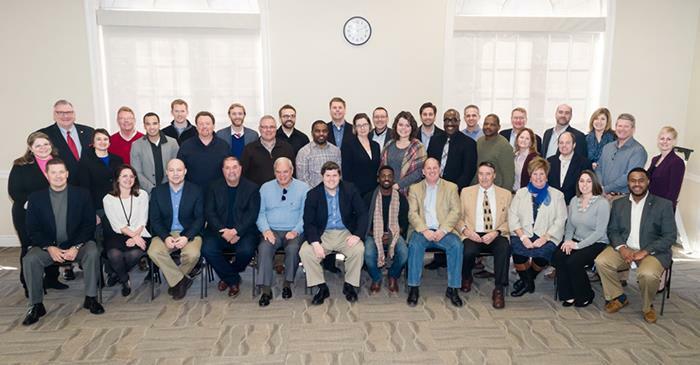 Elected officials participating in the new legislator tour pose for a picture in the Student Union Building Hub with President Susan L. Thomas. The delegation visited Kirksville, Dec. 8, as part of the tour to showcase parts of the state to newly elected members of the state legislature. 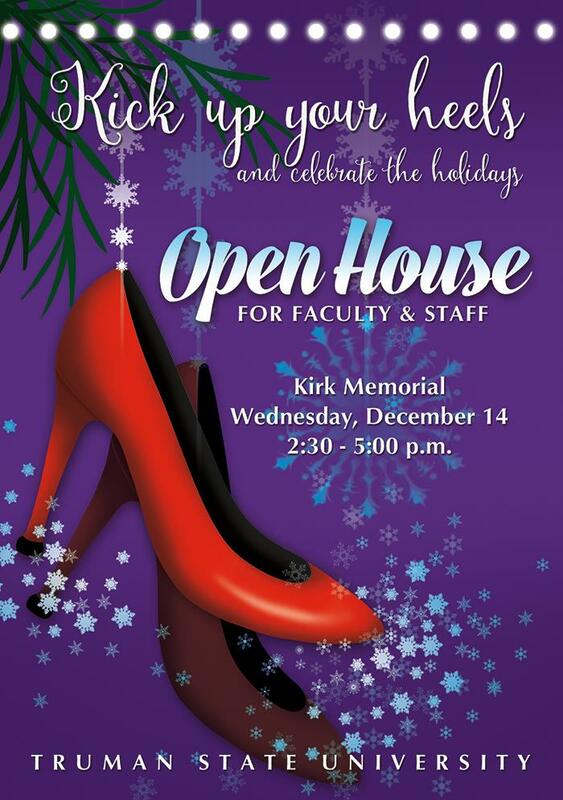 The Military Science Department will host an open house, 10:30 a.m.-2 p.m. Dec. 14 in Barnett Hall 2217 and 2230. 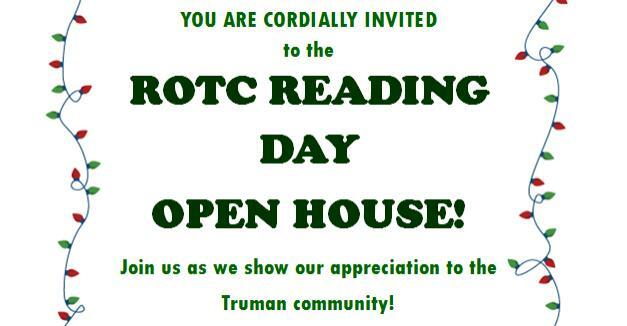 ROTC is celebrating to show their appreciation of the Truman community. Food and festivities will be provided. The following students have been selected to represent the 2017 Greek Week Committee. Greek Week will be the first week of April. More information about Truman’s Greek Week can be found at greekweek.truman.edu. 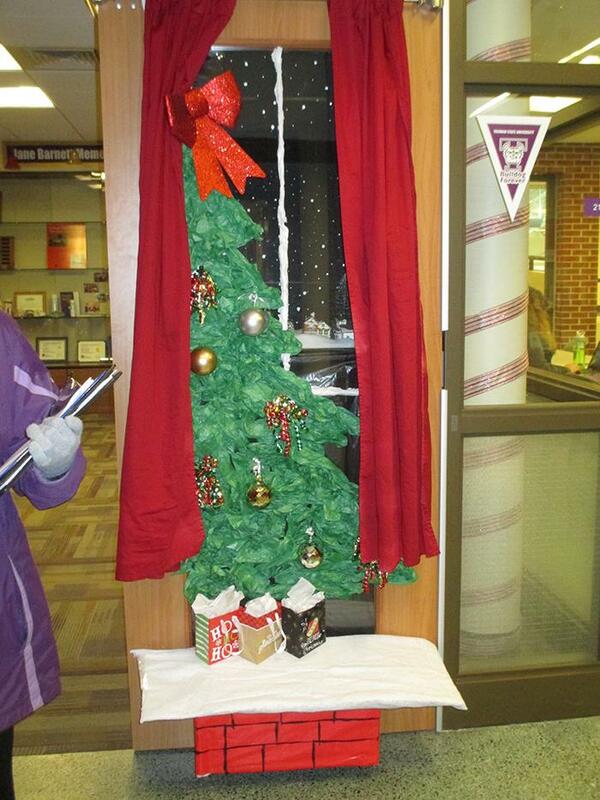 The winner of Staff Council’s annual Holiday Door Decorating Contest is the Health and Exercise Sciences Department. Honorable mentions are Intramural-Recreational Sports and the Registrar’s Office. Additional judges’ pick recognition goes out to Campus Recreation, Student Affairs and Track and Field A. There were a total of 15 entries this year. To view the gallery of all submitted doors and participants, click here. 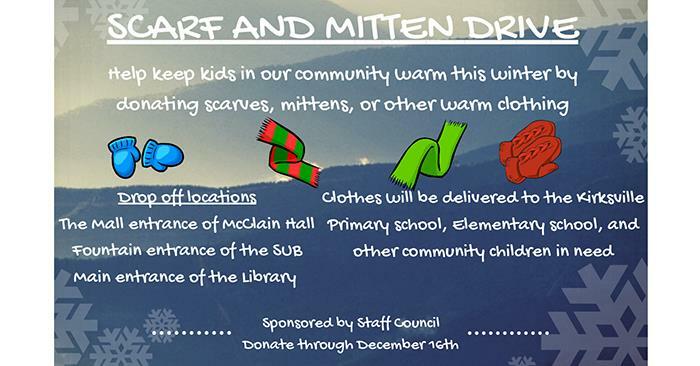 Staff Council is hosting a campus-wide scarf and mitten drive to benefit local children. All warm clothing is welcome, and donated clothes will be delivered to the Kirksville Primary School, Elementary School and other community children in need. Drop off donations through Dec. 16 at the Mall-facing entrance of McClain Hall, the fountain-facing entrance of the Student Union Building or the entrance to the library. Residence Life is inviting students to celebrate random acts of kindness. During finals, it can be easy to get bogged down with classes and schoolwork. Instead of stressing, ResLife is encouraging all residents to take note of the random acts of kindness that happen every day in the residence halls. At each hall desk, there will be a jar for residents to place the name of someone they noticed doing a random act of kindness. The names from the jars will be collected and the individuals recognized with a special door decoration. Students are encouraged to take a study break and recognize a resident who made someone’s day a little bit better. 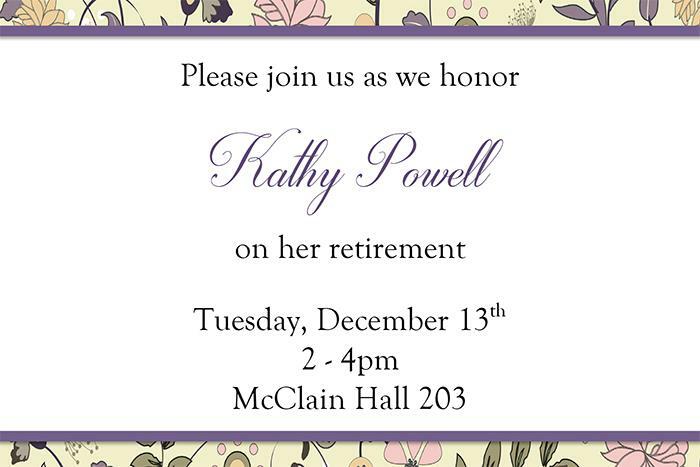 Campus Recreation will host a retirement reception for Cathy Williams, secretary, at 10-11:30 a.m. Dec. 16 in the Student Recreation Center Conference Room. 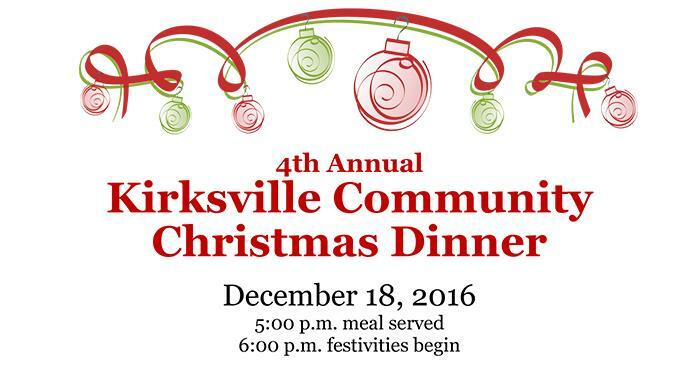 Residents from Kirksville and the surrounding area are invited to a free Christmas dinner at 5 p.m. Dec. 18 in the Student Union Building. Dinner will start at 5 p.m. and will be followed by an evening of other festivities beginning at 6 p.m. Monetary donations and gifts are strongly encouraged to support the annual dinner. Donated funds can be mailed to Community Christmas Dinner, 1716 S. Orchard, or dropped off at Alliant Bank at 201 S. Baltimore or American Trust Bank at 2817 N. Baltimore. 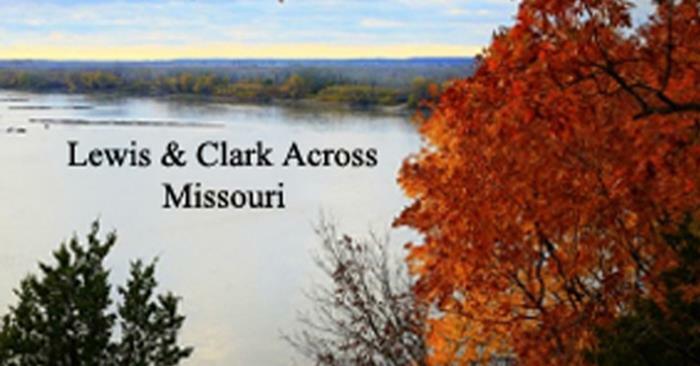 The exhibit, “Lewis & Clark Across Missouri,” sponsored by the Missouri State Archives, will be on display in the Pickler Memorial Library gallery until Jan. 16. Showcasing the expedition’s course along the Missouri River, these panels document the earliest mapped version of the river and illustrate the rich natural resources available in the 19th century. Rounding out the exhibit are authentic Native American arrowheads and tools courtesy of the E.M. Violette Museum, as well as a variety of animal specimens, provided by the Biology Department, representing what Lewis and Clark might have seen along the way. The Fulbright UK Summer Institute Programmes offer students the opportunity to be immersed in the study of British academics and culture. Students will take part in research, collaboration, presentation and cultural events at a British university. They will enhance their leadership skills, develop knowledge and understanding of new subjects and become ambassadors for the United Kingdom and the United States. The awards will cover the majority of all costs incurred, including flights to and from the UK, university fees and room and board at the host university. The deadline for 2017 applicants is Feb. 23 Questions should be sent to the Fulbright Awards staff. Students should file the 2017-18 Free Application for Federal Student Aid (FAFSA) well before Missouri’s priority deadline of Feb. 1. Applications opened Oct. 1, significantly earlier than previous FAFSAs. Students are encouraged to take advantage of this new opportunity. For more information about these and other changes to the 2017-18 FAFSA, visit the FAFSA website at studentaid.ed.gov/sa/about/announcements/fafsa-changes. FAFSAs must be completed using “prior prior year” tax information, which means 2015 tax information must be used for the 2017-18 application. Information collected in the FAFSA is needed to determine Title IV federal aid eligibility and for some other federal, state, University and private programs. The state’s priority filing deadline for the Access Missouri Grant Program is Feb. 1, but applications submitted before April 1 may still be eligible for the Access Missouri Grant. Awards will be made until funds are depleted. Go to fafsa.gov to fill out the application. For more information, contact the Financial Aid Office at 660.785.4130, finaid@truman.edu or visit the office in McClain Hall 103. New summer and semester programs are available for study abroad in Australia at Bond University. Located on Australia’s Gold Coast, Bond University is an hour’s drive from Brisbane, with easy access to attractions such as the Great Barrier Reef, some of the world’s finest beaches and the large rain forest areas of the north. The university is Australia’s first and largest private university and offers courses in a variety of disciplines, including accounting, communication and media, health sciences, psychology and more. For more information, visit ccisabroad.org/program.php?link=australia_bond. Applications for the summer semester are due March 1. For more information and to apply, contact the Center for International Education and Study Abroad, located on the first floor of Grim Hall, at 660.785.4076 or at ciea@truman.edu. Truman will offer the course INDV 115 - Personal Financial Wellness during the first block of the spring 2017 semester on Wednesdays from 2-3:20 p.m. The course covers a variety of financial wellness subjects and is worth one credit hour. It is open to all undergraduate and graduate students. The course IDSM 352 – Understanding the Black LIVES Matter Movement, will be offered for two credit hours in the spring semester. The class will meet from 6-7:50 p.m. on Wednesdays. 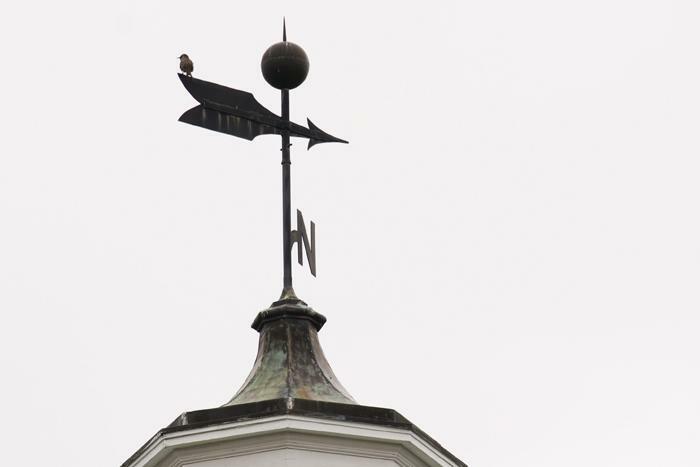 The next issue of the Truman Today will be available Jan. 17. Thomas Trimborn, professor emeritus of music, had his article, “Lincoln’s Symphony: A Conductor’s Essay about the Second Inaugural,” featured in the current issue of The Lincoln Herald, published by Lincoln Memorial University. The article discusses the numerous parallels between the structure and content of the inaugural and some of Beethoven’s symphonies. He joins a growing number of scholars who argue that, in spite of the fame of speeches such as the Gettysburg Address, the Second Inaugural was actually Lincoln’s greatest speech. 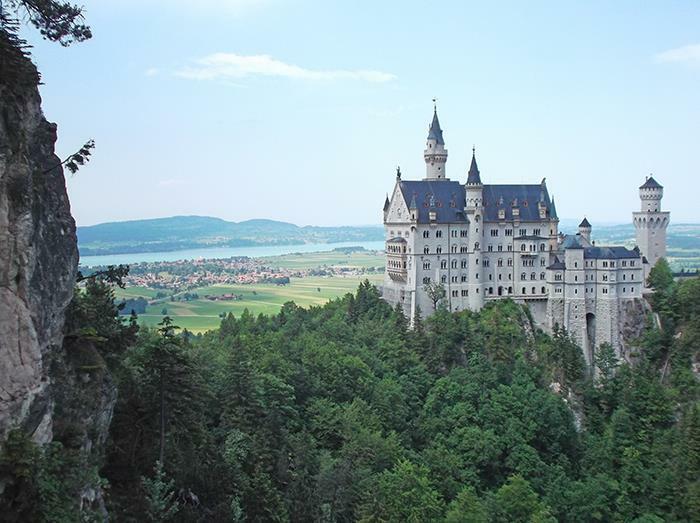 Foundation scholarships for those studying abroad in 2017 are open to students. Applications are online and are due by midnight, Jan. 19. To apply, log in to TruView, go to the Student Tab and click “Foundation Scholarship Application” under Student Finance.